You're probably looking into buying a succulent because you've heard they're the easy plant. Like TV husbands in the '50s, they're sturdy, handsome, and will pretty much stick by you as long as they're fed. But here's the thing: Houseplants and marriages are always more work than you think they'll be. And that includes succulents. You can be a successful succulent owner, though. It just takes a little know-how and a little care, and we're about to teach you how, since you wouldn't be here unless you cared. 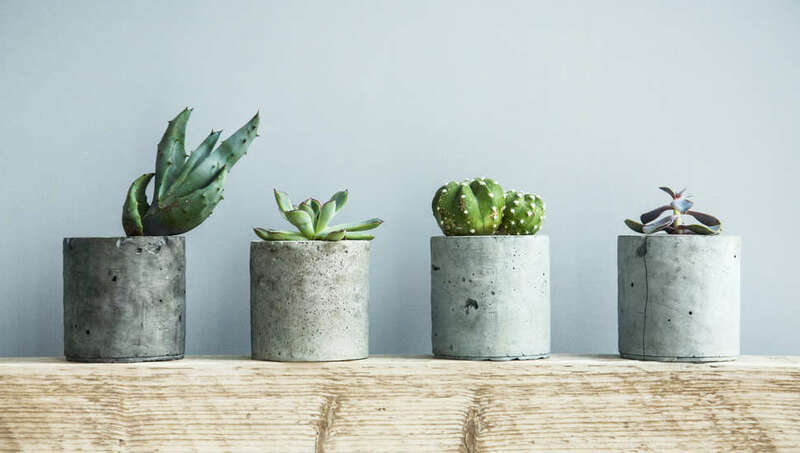 There are a bunch of types of succulents -- Haworthia, Gasteria, and aloe vera are all popular starter-plants -- so we'll try to stick to general principles that will keep almost any succulent happy and alive. 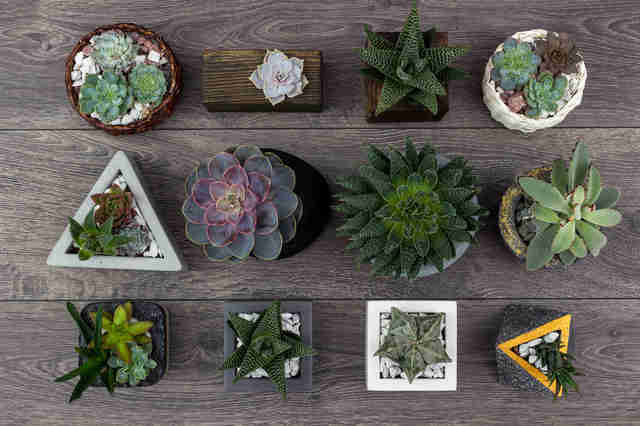 First, you'll want to get your succulent a nice home with drainage holes. This can be a traditional pot, some modern geometric container, or a kitschy animal-shaped receptacle, but you'll want drainage holes. These are important because if the plant's roots get too much water, they'll rot. The roots also like good airflow, so while glass containers look cool, their general lack of drainage and breathability make them bad hosts for your succulent children. As your succulent starts to grow up a bit, some of the lower leaves will die. Don't panic. Just gently and ruthlessly pluck these dead leaves out of the plant like they're fake friends. They result in more shade, which makes it harder for the soil to dry. That space you freed up will also encourage new growth along the stem. Water is the biggest obstacle to your succulent's survival. The basic rule here is to water the plant a lot at once, but not often. They need more water than their reputation might have you believe, but absolutely do not water your succulent every day. Soak it until water is coming out of the drainage holes, then leave it alone until the soil is totally dry. Then repeat. If you water too frequently, the moisture will make the plant's roots rot. And that's not what you want. Also note that in the cooler months, the plant goes into a dormant period that requires less water, but as long as you're monitoring the soil's moisture level you should be fine. With this strategy, you'll probably water your succulent about once a week. If you check the soil and it's totally dry after a week, soak away. If it's still moist, wait a bit. The frequency will also depend on how large the container for your succulent is. If it's a giant pot, that means it can hold more moisture, so you'll have to water less frequently; if it's a little pot with a shallow chamber, you'll end up watering it more. Since you're growing your succulent indoors, pay attention to the color of the succulents you're purchasing and tend toward the green ones. 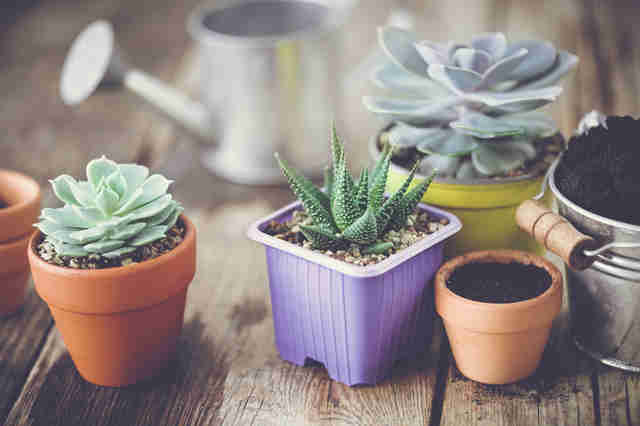 Brighter succulents with colors like orange and purple might look pretty, but they'll likely require more sunlight than you can provide, so stick to the darker, heartier ones. Green or not, supply them with as much light as possible. Outside they want something like six hours a day, but inside don't even think about it in terms of hours. Just get them in the sun and keep them there. Place them near the window that has the most light per day in the brightest area you can manage, as close to the window as possible. You'll be able to tell if your plant isn't getting enough sunlight if its leaves start to stretch. Your succulent child is bending and expanding in a feeble attempt to get as much light as it can, so the least you can do is move it closer to the window or to a brighter area. If that's not possible, you can look into purchasing a grow light, which mimics sunlight and could save your little plant's life. In soil as in pots, you're going to look for something that promotes drainage. The easiest way to find proper succulent soil is to look for a cactus soil mix that's categorized as "fast draining." If you're more of a hands-on plant parent, find soil with quarter-inch particles that contains perlite or mix perlite into soil yourself. Perlite is volcanic glass that’s heated until it pops and expands, which makes it lightweight and creates a bunch of little air compartments. The air pockets mean perlite is porous, so the water drains easily, which, again, will keep your beloved plant from rotting. So remember: Supply your plant with as much light as possible, make sure its soil has proper drainage, and soak the heck out of it once it's completely dry and only when it's completely dry.